Av. de la Cruz Blanca 1, 29200 Antequera, Spanien. Las Villas de Antikaria Hotel is located in the monumental city of Antequera, place full of history and geographical centre of Andalusia. Las Villas de Antikaria Hotel offers 33 completely equipped rooms, where the guest´s relaxation and contentment are the most important. The hotel offers a great number of leisure activities, such as the close golf course or the cultural visit through the old town. The establishment is perfect to celebrate any social or professional event, too, disposing of sitting rooms with equipped with the highest equipment level and with capacity for 250, 500 and respectively 1200 people. 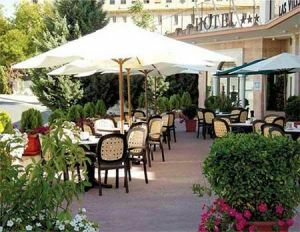 Among its large range of services, it stands out a splendid restaurant and its large meeting rooms. Very well-connected and at around 20 minutes from the airport, Las Villas de Antikaria Hotel is ideal both for tourists and the people in business trips. 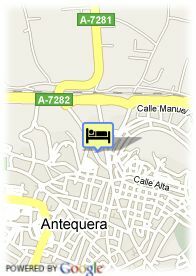 Hotel awarded with the Integral Tourist Quality System (Sicted). Bezahltes überdachter Parkplätze beim Hotel (8.00 €), Reservierung erforderlich. Stadtzentrum, in der Nähe der Altstadt. ältere Kinder und Erwachsene: 19.00 € pro zusätzliches Bett. Visa, Diners Club, Maestro, Mastercard, American Express, Red 6000.